I have been trying to hone some of my digital skills. I have never really done a portrait digitally. 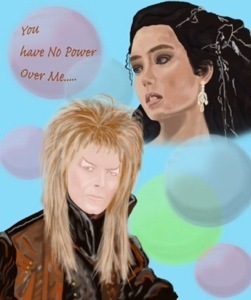 So I have this photo I grabbed online of David Bowie as the Goblin King from The Labyrinth movie and thought I would use it as my inspiration. Love that movie…dont you. I am using an old version of PS CS2 and an Intuos graphics tablet. 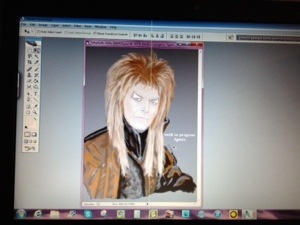 All done on my old laptop which is really feeling it’s age when I work. Like me it’s having memory and processing issues, I feel it’s pain. I started to lay down some base colours and lines, using very faint colours. I had about 20 layers and as I get to a point where it looks okay, say on the eyes I will flatten some of it down so there are not too many layers. As I move forward I just keep adding colour and shadow, highlights. Trying to get all of the facial features. 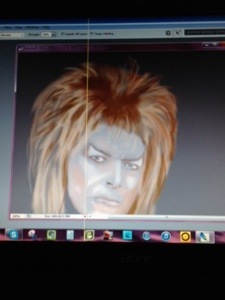 I am at a good point, it looks like Bowie. This weekend I will be adding some of the finer details. I was thinking it might make a good print or if I come up with a tag line/text a card. What do you think. Any feed back is welcome.